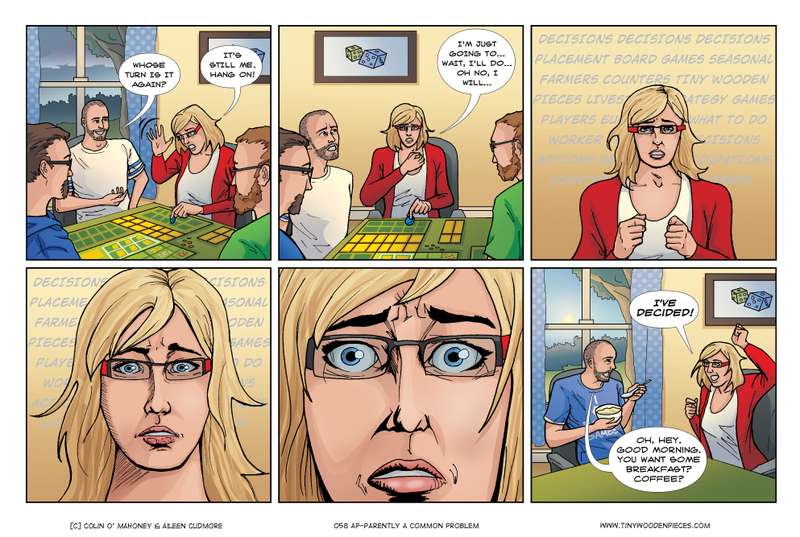 We don’t yet own Agricola, which is the game being played in today’s comic. The strip being more about a condition encountered in people playing games of a certain, broad type, and having only six panels to play with, we thought it okay to sub in a game we have no direct experience of, as a form of shorthand. A panel-bound form of poetic license, if you will. I mentioned a few weeks ago we were looking for some games that would explore different play styles – less player conflict, more interesting themes, which means Agricola has begun to hover around the edges of our radar, and threatens to take root in our wishlist. The game ranks no. 6 on Board Game Geek, but a top 10 listing no longer carries the weight it once did for me. After a few years of board gaming I see the rankings differently, and use a number of different sites to help judge my interest in a game, and whether or not I should consider it. When we were new(er) to the hobby, the top 10 on Board Game Geek seemed a pantheon of must-haves, an assembled list of the Titans of gaming, lining up in convenient order to be purchased and enjoyed. But obviously there is more to it than that. Picking a game from such a list now seems equivalent to going to Amazon and buying the no. 1 selling book (currently a guide to eating in a manner that would allow me to “get the glow“) because obviously this must be the best book. Which would be ridiculous (I glow just fine as it is). As long as I’ve been aware of the site, Twilight Struggle has been the no. 1 ranked board game on BGG. So, not always having been so enlightened, and treating this list as gospel, we purchased it. I have never enjoyed playing it. I find it restrictive, and frustrating in the extreme. Every turn seems guided, if not dictated by the hand you are dealt, and the phase of the game. I can never seem to find enough wiggle room to eke out a turn I could actually call my own. The game just rubs me the wrong way. Of course, I’m not suggesting that close to twenty thousand BGG users are wrong. It can’t simply be the cards and luck that determine the outcome of Twilight Struggle. For one, Aileen always wins when we play, which implies something more than luck. So clearly there is something there that I haven’t discovered, or that just refuses to click with me. I keep thinking I will go back to it, give it another chance to deal me a hand to call my own. But there are just so many games to play, and so many more we must buy and then play. And now that I know what to look for, and how to look, I can be more certain of enjoying those games that we do buy. I know the mechanics that interest me, the genres that excite me, the right level of luck and skill, strategy and tactics that will appeal to me. I know the reviewers that share my tastes, and those that don’t. I can tell by watching a play through if the game will interest or bore me. I can judge fairly well if I will be able to find people to play it with who will enjoy it as much as I do. And that last point may be the most important metric of all, for me. I agree with you about the progression from “everything is exciting and everyone on the internet know more than I do – buy all the things” to “I know what I like, what I don’t like, which reviewers understand me, and what I’m likely to get to the table” is an important one. My cupboard is stacked with games that I thought looked great, but have seen minimal play time. (Some of them *are* great, of course). I have a small collection of completely unplayed 2 player games (of varying quality – Draco Magi, A Duel Betwixt Us, oddball Aeronauts), and barely played games (Among the Stars (played once), Arctic Scavengers (played 2-3 times), Escape (played twice), Nothing Personal (played twice), Sheriff of Nottingham (played once), Mammut (played twice)). I’m getting more discerning (although I really need to just *stop* buying new games – especially now I’ve ordered Dead of Winter….). You reckon Caverna is a better option than Agricola, then? Well – I’ve not played either myself, but many of the reviewers that I listen to have implied that Caverna is essentially a “fixed” version of Agricola – Tom Vasel and the Dice Tower guys, for example. Based on the similarity between the games, I would certainly recommend you look into both before picking one. Those of us on Team Agricola dispute it needed fixing! It is a different take, not a fix, Agricola has a hand of cards which is yours, Caverna has open tiles for anyone to get. Agricola has you build a diverse farm (but how you get there is up to you) and there is a real tension in doing that while feeding everyone. Caverna is more relaxed, you can specialize without severe penalty. Which of those is for you is up to you. Sounds like we have more research in store for us! What is it exactly that people think needs fixing? Is it the fact that only one person can use each tile, because I think that’s a major positive of the game? Or is it because you have to have a bit of everything? The main reason we don’t play it more often is just because my boyfriend complains about having to set up all the little pieces. I would not call Caverna the “fixed” Agricola like many. I would call it a sandbox game inspired by Agricola. They are both absolutely fantastic games but Agricola you get a large hand of cards at the beginning and you have to figure out how you are going to make this situation work for you. In Caverna all the buildings are always available to everyone and it is more about what you make of this open world. Which one is for you depends on if you like that open world or you like to have a personal puzzle to solve. Personally, they are both for me, it just depends on the day which one is more-so. Well that ambig-if-ies for us! Actually, it does make both games sound really appealing in different ways I hadn’t realised they differed in the ‘type’ of game they were, that is actually useful to know. Shut up and Sit Down are a really great review site. I find Tom Vasel of the The Dice Tower to be a reviewer I generally agree with, and Rahdo Runs Through is very informative. Oh that… that is just me to a tee. I spend so long thinking over every move, and yet I just love playing that sort of game. I love playing Agricola: agonising over each move, carefully planning out each step to take, finalising all my decisions and then end up having some mongrel take the space I needed and ruin everything! Need to play it more often. There’s nothing worse than having a whole turn(s) planned out in your head only to have someone unwittingly ruin everything forcing you to rethink everything, usually JUST when your turn’s come up. Ah, but then there’s the joy of doing the same thing to someone else next turn! Or am I the only sadistic person who enjoys that? If you’re considering a heavy Rosenberg, consider Caverna. I haven’t played Agricola myself, but a friend of mine who’s played both found Caverna more enjoyable and less stressful than it’s older brother.